While it wasn’t perfect, Kawasaki’s hot-selling Z800 was a very tempting package. 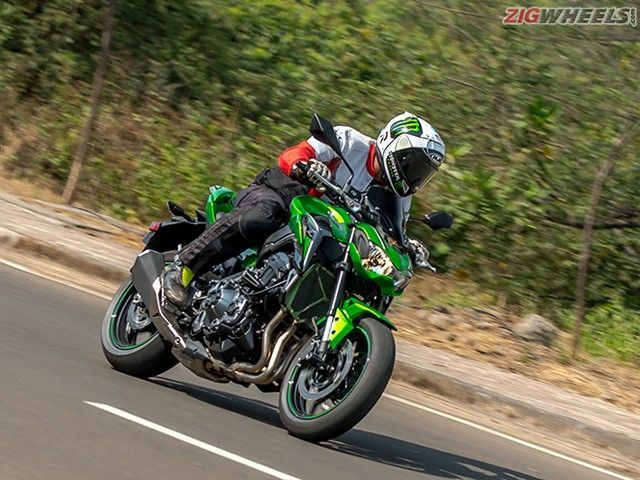 Will its successor, the Z900, stamp its authority in the mid-displacement category too? The Kawasaki Z800 was a good looking naked, almost as punchy as a full-blooded litre-class; dished out reasonably engaging handling, and offered good everyday usability. Unsurprisingly, it has been Kawasaki’s most popular ‘big bike’ in India. But, it had a few shortcomings and the new Z900 promises to better it. So what’s new, you ask? A lot. Actually, almost everything. The design, just like the current Z1000, follows Kawasaki’s ‘Sugomy’ design philosophy, resembling a beast in a crouching stance. The result is a more chiselled body shape. The partly exposed tubular steel trellis frame and muscular fuel tank do their bit in creating a leaner and meaner aura. The bike shown to us (and given to us for a short spin) had a rear seat cowl that’s part of the accessories you have to buy the motorcycle with, but more on that later. The Z900 looks similar to the Z800 from the rear three-quarter, though the ‘Z’ shaped tail light is new. Green-coloured rim tapes have been carried over from the 800. Clocks are new and look similar to the Z650’s. Coming to the accessories – for now, the Z900 is available with a set of mandatory accessories. The list includes a flyscreen, crash bobbins for the front forks, engine guards, engine casing covers, a gel tank pad, different seat cover and pillion seat cowl with cushioning for the rider, a 12V charging socket on the handlebar and a radiator guard. Collectively, the accessories should be worth close to a lakh rupees, and the good thing is the accessories are not just aesthetic but functional too. Most importantly, it is 21kg lighter! That’s the amount of weight I would like to lose to be able to go faster on a motorcycle, but Kawasaki has made the bike do all the hard work for me. The Z900 is now powered by a 948cc, liquid-cooled, inline four-cylinder engine that has been derived from the Z1000’s engine. The engine has the same bore as the Z1000 but the stroke is now shorter. Output stands at 125PS, produced at a lower 9500rpm as compared to the Z800’s 113PS that was produced at a higher 10,200rpm. Peak torque has jumped to 100Nm from the Z800’s 83Nm that was produced at 8000rpm. The crank is lighter to help the motor rev quicker, and effectively, the Z900 should feel more eager even at lower revs. This should make it feel more athletic and improve usability at low speeds in city conditions. Like the Z1000, Kawasaki claims the Z900 will also boast of a more prominent intake sound when accelerating, adding to its theatrics. In fact, we’re told Kawasaki’s own Sound Research Division has worked extensively on the intake sound by designing and tuning the airbox specifically for a pleasing acoustic effect. And the Z900 does sound better with its fuller soundtrack. The riding position is similar to the outgoing motorcycle’s, though the big change is the lower seat height. Saddle height is 795mm now, down by 39mm from 834mm. The lower seat helped me place both feet flat on the ground which wasn’t the case with the Z800, despite the fact that I’m just an inch under six feet tall. The riding position is still aggressive with a slight forward bias but will not load up the rider’s wrists. The lightness of the clutch at the lever was the next thing I noticed. The sounds from the intake and exhaust were pleasing on the go, and certainly more satiating than the Z800’s. The optional Akrapovic exhaust should make the Z900 sound even better then. The engine is not only quick to build revs but power felt more accessible too, as the bike seemed to be making rapid progress on the narrow road I was on. At the same time, the engine felt extremely smooth, as you would expect of an inline four motor from Kawasaki. As soon as I tipped the bike into the first sweeping curve on our improvised test track, the lightness of the front end was apparent almost instantly. The ride was too short to comment on the handling but if the few curves I was able to lean into are anything to go by, the Z900 is way better than its predecessor at tackling corners. With the new Z900, Kawasaki needs to lead the charge in the segment. Its closest rival, the Triumph Street Triple, has gotten more sporty, more powerful and is ready to hit this segment soon. When you compare the technology offered, the lack of rider modes and traction control on the Z900 will make it seem a bit dull when compared to the Ducati Monster 821 and the upcoming Triumph Street Triple. However, when you consider the Z900’s price tag of Rs 9 lakh, ex-showroom New Delhi, which includes a handful of accessories, you know that this Kawasaki makes a lot of sense, just like its predecessor did. Share your experiences with Z900?